Some of the teams that were playing in both competitions should not be trading and these clubs and the league that they operate in are on the precipice. While I write this I am wearing my Webb Ellis-tinted glasses but it is indisputable that rugby is very good to this country and very good for it too. It is hard to quantify the galvanising effect a win in Dublin over England can have. Even a win against the French energises the people. We now have two provinces in the semi-finals of the Champions Cup. There isn't time to even bask in the glow of a win over England as the scramble begins for vantage for these huge matches. We do so oblivious to the fact that some of the teams that played last week cannot continue to trade for more than one or two seasons more. A couple of weeks ago we woke up to the news that a merger between Racing 92 and Stade Francais had been agreed - this was most unexpected. Chelsea and Arsenal or United and City putting their differences to one side, all for the good of a super club! The league, The TV mandarins, the Mayor of Paris and least/most (delete as appropriate) important of all, the players hadn't been informed or consulted. The job was a fait accompli. Player strikes and fan power forced the principals to change their minds and the deal was, eh, shelved. Hurrah! Nobody asked why the merger was put together in the first place. The answer is obvious - it wasn't a merger, it was a rescue. Stade are a financial basket case. When Thomas Savare, the IT whizz and owner of Oberture PLC, bought the club from Max Guazzini - that is bought it before it went into liquidation and was demoted two divisions - Savare probably didn't realise what he had just done. Savare has had to pump €30m of his money into the club and he simply does not want to put any more in. Expenditure and the wage bill dwarfs its income and that income includes TV revenue streams from Canal Plus and Be-in Sport. The lunacy of exorbitant player salaries caught up with Stade five years ago but they carried on regardless. The truth is that if you want to be a sugar daddy you have to be a billionaire not a millionaire. I am not sure why Jacky Lorenzetti, Racing's billionaire owner, agreed to such a rescue; there cannot have been too many synergies, there would be too much bad blood about the deal. Stade play Bath in Paris in the semi-final and have a good chance of winning the Challenge Cup. If they win the cup they get a couple of hundred grand. A quarter of Sergio Parisse's salary. Unsustainable! Wasps brought an expensively-assembled ensemble to the Aviva. 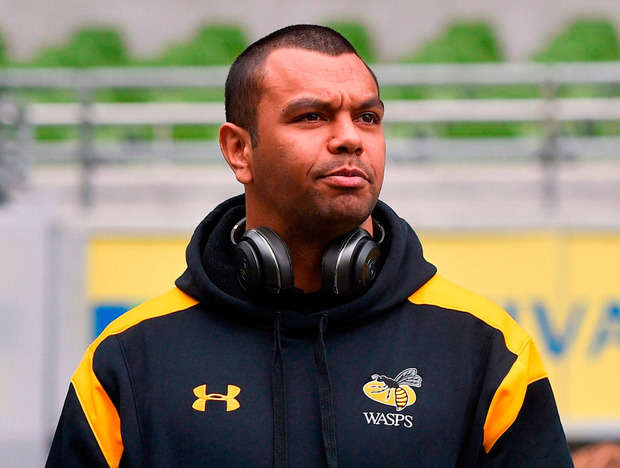 Kurtley Beale (above) on £800k for the season and Willie le Roux not far behind him. If Leinster had kept their shape and concentration, they could have put 50-plus on Wasps. They are top of their league table but who amongst you think that Saracens won't win the Aviva Premiership? Wasps were on the brink of extinction several years ago and people think that because a bit of rinky-dink financial engineering that they have magically made their troubles disappear. Wasps have subordinated debt of £43m on the back of a five-year bond on a coupon of about 5pc. They posted a loss of £3.8m for the last financial year but only because they exercised a £7m tax credit. That is €10.8m and this on the back of the fact that ticket sales were up 19pc and hospitality and sponsorship up 86pc. The Ricoh Arena has a casino, a hotel, a conference centre and numerous restaurants and pubs. It has even hosted Bruce Springsteen and Rihanna in concert. They can host God the Father, the Son, the Holy Spirit and Brian O'Driscoll in the Divine Barber Shop Quartet if they like but as long as their outgoings exceed their income, they are going to fall off a cliff. A debt pile of £43m secured on the stadium which is still at £48.5m. Another loss the size they had in 2016 and they will have their financial advisors looking to see what their banking covenants actually say. £800k for Kurtley? The team that will win the Premiership - Saracens - who play Munster in a fortnight are even in a more perilous state! They had a £45m hole in their balance sheet. It is hard to know how much they really lose on a per-annum basis. They got in trouble by undermining the RFU wage cap of £5.1m - by £9.8m to be exact. The cap goes up to £7m in 2017/'18 but Saracens could be beating that by at least 50pc again - big squads silly salaries and now in the soup. Nigel Wray, Saracens' owner, is nearly 70. How much longer is he going to guarantee their overdraft? His purchase on reality is also slipping somewhat and commenting on the salary cap recently he said: "We need to change the farce whereby we are all operating under different rules. We have one wage cap, the Irish provinces have no wage cap and the French clubs are twice ours - all of which makes no sense whatsoever, it needs to be changed." You are right Nigel, it does need to be changed but we are too far gone in some instances. Debt forgiveness for rugby clubs who spent too much money buying players - don't think so! The reason the Irish provinces don't have a wage cap is because they run their business in a prudent and responsible manner. The only issue they have here is trying to retain their players because clowns like you pay ridiculous amounts of money to try and take them. Needs to be changed to suit you Nigel? Nigel Wray will not live forever and when he goes I hope Saracens have a munificent benefactor who will continue to fund this lunacy. If not, they will fold. The RFU, I hope, have a contingency fund in place to buy all of their profligate clubs when the curtain comes down. This brings us on to Saracens' semi-final opponents Munster. There is about €9m still owed on Thomond and it appears that the IRFU have had to reschedule the debt on the back of a cash-flow deficit of €1.95m for year-end 2016. Munster have addressed these issues responsibly and whatever about the feel-good factor of being in the semis, the jump in crowd sizes means a big jump in revenues which won't be all spent on players' wages. The Welsh rugby union had to buy the Dragons last month; otherwise it would have folded. Munster, an IRFU entity, are not even close to that sort of a scenario. Mick Dawson keeps telling us that Leinster haven't a bob - I am sure there are one or two people somewhere in the province who believe him. Their Champions Cup semi-final opponents Clermont are, I believe, also in rude health financially. Good to see that the financially prudent also get represented at the top table. Enjoy the rugby folks - this will come to a halt in the next year or two! One of the English teams is going to go bust and the whole PRL edifice could come crashing down. Leicester are having to go down the debt route now to keep up with the wage inflation. The Gloucester lads seem to be desperate for the Montpellier owner to fund their dreams. The elephant in the corner of the room is BT and whether they will keep chucking so much money after a sport that really isn't worth what they are paying for it. The other thing that is entertaining is the number of English players coming out of the woodwork saying they are unhappy with PRL's plans for an 11 month season. Marler is saying today that he thinks a six week six nations is a terrible idea, maybe he is not as thick as I imagined. The sad thing is that we need the English and French "Giants" in the game to keep the general populace interested. We may look on As they crumble but how long before they pull out of all European competition to lick their wounds. Would we still be able to attract the Jaco Tautes and the Doug Howletts if we're not in such a high end competition? The problem with this world is there are too many snakes... and not enough Ladders! I can kind of understand Wasps going into debt. They got a stadium casino etc for a bargain, so they always have that as something they could sell down the line if they don't pay off their debts. Saracens I don't get. Why would the owners pump so much money into a club like Saracens? They;re winning things but that doesn't bring huge financial rewards. Whats interesting is - as mentioned above - the effect its having on other clubs. Leicester should be the wealthiest club judging by their attendances and it is a well run club but now they're under increasing pressure to start spending big. Northampton are another well run club but they're also slipping behind Saracens and Wasps. The fans of those clubs expect to be challenging for titles, not being as far behind Saracens as they are. Gloucester are another underperforming side as well as Bath and Harlequins. They're all under pressure to close the gap between themselves and Saracens. But yet they declined to put the boot in when the issue of breaching the Salary Cap came up. I think that is because they and Salaries know that the salary cap would not stand up to a legal challenge. I don't know TPP in the NBA, NHL etc it seems to work. The thing in those are though the NBA or NHL or NFL own every player. Salary caps mean whatever franchise owns them pays their wages but any top ups etc (illegal methods) can be caught straigh away. Hard to see that come in. But if all clubs agree to it and agree that there are penalties for breaching it why is it legally vulnerable ? A friend of mine is the Gloucester lawyer and he reckons the salary cap can't be anything other than a gentleman's agreement. Wray and Craig, who are the chief offenders, aren't gentlemen. The problem for the English teams is that Saracens are not even close to adhering to the salary cap and everyone else has to try and compete with the wages they are paying. All times are GMT. This page was generated at 18:59.